In my last post I mentioned the Cookie Swap I hosted and the mulled wine. I had a few emails asking for the recipe and here it is. 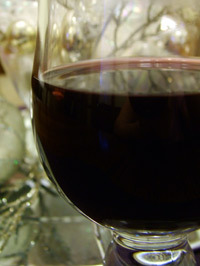 I used a Canadian Shiraz-Cabernet Sauvignon blend by Pelee Island Winery. Enjoy and toast to a Merry Christmas! Peel the citrus using a carrot peeler aka speed peeler. In a large saucepan add the lemon, lemon, and clementine peel to the juice and sugar. Add the spices except for the star anise and add the cognac. Pour enough wine over the mixture to just cover it. Heat over medium heat until the sugar is completely dissolved. Bring the mixture to a boil and simmer for 5 minutes. Stir frequently. When the mixture has boiled add the remaining wine and the star anise. Heat gently for an additional 5 minutes and serve warm.